Welcome to Beach scrapbook layouts, here you find unique and creative beach scrapbook layouts that will surely inspire you to create lovely beach album. 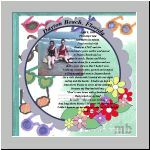 You can also use some of these beach scrapbooking ideas to preserve you beach vacation for generations to come. Just go to your Scrapbooking Layouts Page and choose the most relevant scrapbooking theme for your Scrapbook. It keeps you informed about scrapbooking ideas , information, tips etc that I have added, including some great scrapbooking ideas layouts. Or you can send send your ideas, suggestions feedback etc that will help us improve your scrapbooking experience. click here. Return from Beach Scrapbooking Layouts Gallery to Scrapbooking Ideas Layouts Gallery.